So what's almost everyone's favorite comfort food? Mac and cheese, right? 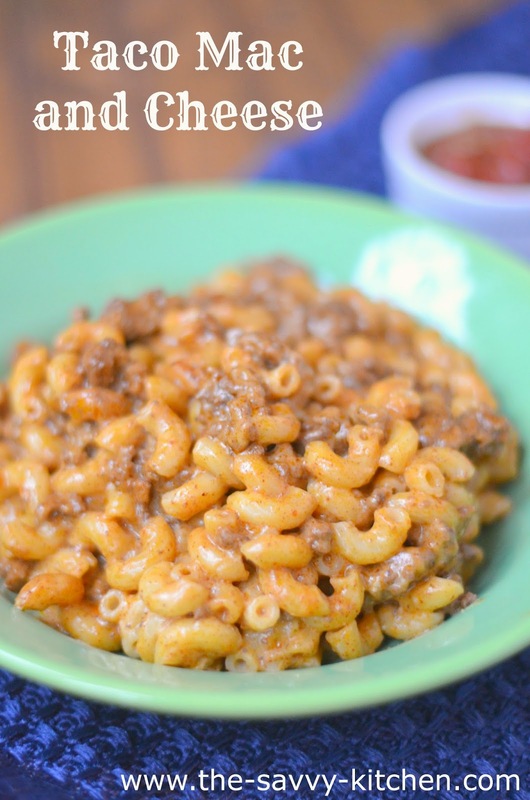 Imagine that thick and creamy, cheesy mixture mixed with another dinner staple: tacos! 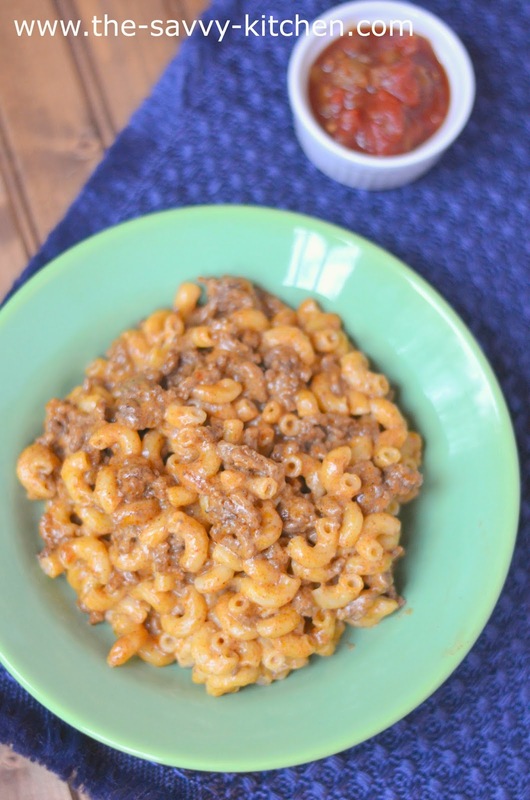 The spicy and flavorful taco meat is stirred into classic mac and cheese to make an amazing taco cheese sauce. I mean pasta, tacos, cheese sauce--it's just a recipe for awesomeness. Chris and I were obsessed with this. We both got seconds (and maybe even thirds). 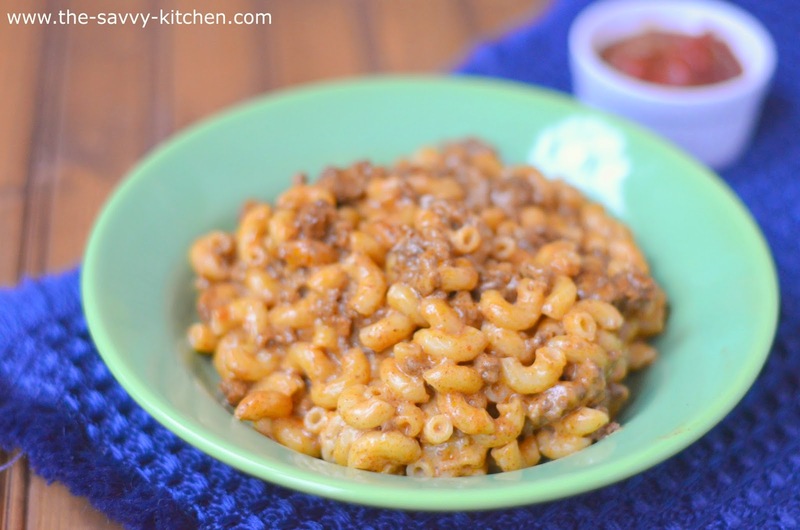 I didn't want to give Bradley much because it was a tad spicy, so I simply set aside some of the macaroni and cheese mixture prior to adding the taco meat. Then (part of the extensive list of) Bradley's dinner was served! Seriously. That boy eats like no other. He has the healthiest appetite and I love it! But if you don't want yours too spicy either, just leave out the red pepper flakes. No biggie. Enjoy! Cook elbow macaroni according to package directions. Drain and set aside. In a large skillet, cook beef until brown. Drain fat. Meanwhile, mix chili powder, garlic powder, onion powder, red pepper, oregano, paprika, cumin, salt and pepper together in a small bowl. Add drained beef back into the skillet. Add water and the seasoning mixture. Cook until most of the liquid is evaporated. Remove from heat and set aside. In a large pot, melt butter over medium heat. Once melted, add flour and whisk until well combined, about 1 minute. Slowly add in milk, whisking constantly. Once combined, allow to cook for an additional 3-4 minutes or until thickened. Slowly add in cheese and continue whisking until fully melted. Remove cheese mixture from heat. Add the cooked macaroni to the cheese mixture and stir to combine. Add beef mixture and stir. Serve immediately.